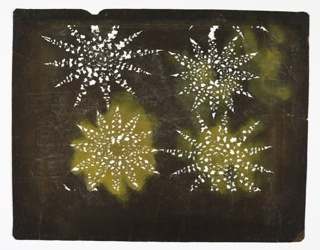 See more objects with the tag dots, identity, grid, starburst, indigo, Yoruba, African. See more objects with the color rosybrown darkslategrey grey or see all the colors for this object. 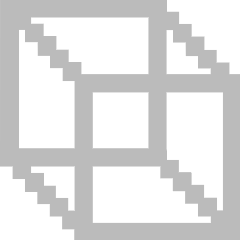 This is a Adire wrapper. It is dated ca. 1960 and we acquired it in 1962. Its medium is cotton and its technique is factory-woven plain weave, tied- and stitched-resist patterning, indigo-dyed. It is a part of the Textiles department. 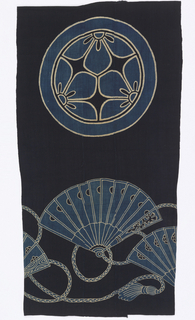 The delicate tracery of white forms on the deep-blue background of this adire wrapper reflects the interaction of raffia embroidery with indigo dye. Patterns are sewn into cotton cloth with a needle and raffia fiber. When dipped in indigo, the raffia resists the penetration of the dye and the embroidered patterns are recorded with an absence of color. 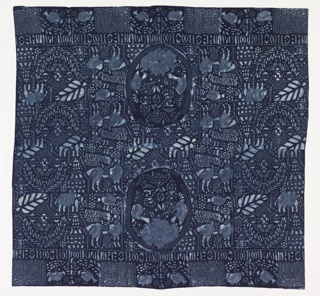 Women are responsible for both the stitching and the laborious process of indigo dyeing. 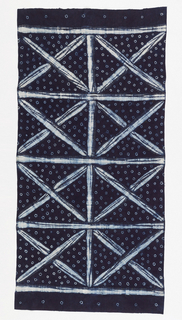 Adire wrappers are relatively inexpensive and worn for everyday use. In the marketplace, the raffia threads are left in place to assure the buyer that the fabric is authentically hand-stitched. Many more hours are then spent removing the threads, washing the fabric, and having it pounded to a soft, smooth, glossy finish. 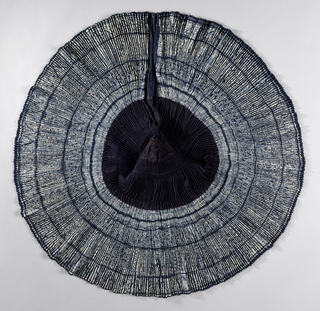 John Pemberton, Rowland Abiodun, and Ulli Beier, Cloth Only Wears to Shreds: Yoruba Textiles and Photographs from the Beier Collection (Amherst, MA: Mead Art Museum, Amherst College, 2004), 21. This object was donated by Estate of Mary Kirby. It is credited Gift of the Estate of Mary Kirby. mulberry paper (kozo washi) treated with fermented persimmon tannin (kakishibu).